I have two daughters, the youngest of which has sensitivity to wheat. We’ve found that a regular dose of Hiland Dairy yogurt helps keep her system happy, so we’ve come up with an activity that’s great for her tummy and creativity. 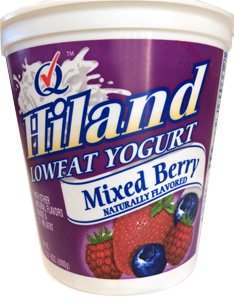 Grab some Hiland yogurt-a 24 ounce container works great and we like to use the strawberry or mixed berry flavors. Place some yogurt into small sections on a “palette” (plate) for each child and add drops of food coloring to give them an array of colors to use. Each child also needs their own canvas in the form of a plate covered in tin foil. Finally, watch them go crazy making their own masterpiece! Once your kids are finished with their art, put it in the freezer. After a few hours you can peel off their work and use it as a sweet and healthy treat after lunch or dinner, or an after school snack. With Easter coming up, we decided to make eggs and bunnies at our house. Don’t use paintbrushes that you have actually painted with before. If your kids need to mix colors, they can just lick the paintbrush to clean it off! My girls loved this part and as a result, changed colors frequently. Suggest to your child that he or she create several small pieces of art. The ‘art’ melts quickly so smaller bites that your kids don’t have to hold for too long will be easier and less messy. What kind of fantastic creations did your kids come up with? Leave a comment below!